Here’s a new compilation of writings culled from Love & Rage, the Love & Rage Federation Bulletin, the Chicago-based Wind Chill Factor, and the publication (Dis)Connection. All were produced in the 1990s and help to give an idea of some of the debates that were happening within the anarchist space in the U.S. in the 1990s. In addition to the pieces above, there is a brief introduction with historical information introducing the various projects and publications. This entry was posted in General on September 12, 2015 by anarchist history nerd brigade. A. Iwasa, the editor/author of the Anarchist History Nerd Brigade zine, The A-Zone and a Decade of Anarchy in Chicago, recently completed a 24-hour zine challenge title that expands on that history. The new zine consists of excerpts from the publication “Passionate and Dangerous” which came out in 1998. It was an effort to document the activity of anarchist and anti-authoritarians in the Midwest by way of conversations with folks involved in a range of anarchist projects. The excerpts featured in this zine concern the A-Zone (Autonomous Zone) in Chicago, with the zine reprinting interviews with A-Zone participants while the project was still functioning. This entry was posted in General on July 15, 2015 by anarchist history nerd brigade. Johann Most is one of the more misunderstood figures in U.S. anarchist history. His reputation is shaped by a legacy of vilification in the mainstream press, with the foreign-born Most being the target of relentless attacks by the newspapers of his day. In Most, the forces of capitalism and order found the stereotype of the wild-eyed anarchist bent on destruction. This zine presents a biographical essay about Most by Emma Goldman, originally published in The American Mercury. It is notable for its profoundly human portrayal of Most, providing a biographical sketch and evaluating his role in the movement. The essay is accompanied by a critical introduction that explores how Most has been portrayed over the years. This entry was posted in Zines and tagged anarchist history nerd brigade, emma goldman, history, johann most, north america, zines on July 6, 2015 by anarchist history nerd brigade. We’ve published a new zine, “Neither East Nor West NYC: A De Facto Anarchist Black Cross History, 1980-1994.” The zine is a reformatted version of an essay by Bob McGlynn that explores the history of the group Neither East Nor West. The group was formed in the 1980s in New York City as a way of extending solidarity to comrades in the East (Communist Bloc). Their activities included a variety of educational and organizing efforts. One of their most prominent contribution was the production of On Gogol Boulevard, a publication that provide updates on activities in the East. It was published both as a standalone publication and also appeared as a section in major anarchist publications of the period including Fifth Estate, Anarchy, The Shadow, and Profane Existence. With its focus on political prisoners, Neither East Nor West NYC in many ways functioned as a de facto Anarchist Black Cross. This entry was posted in Zines and tagged anarchist black cross, anarchist history nerd brigade, history, north america, organizing, zines on June 29, 2015 by anarchist history nerd brigade. We’re excited to announce the completion of our latest project, an updated version of the zine The A-Zone & A Decade Of Anarchy In Chicago. In this new edition, editor Alex Iwasa expands on their previously published history of The Autonomous Zone (The A-Zone) in Chicago and shares new research that provides additional information about both the A-Zone and the larger context of the U.S. anarchist space in the 1990s and early 2000s. A new contribution in this edition adds additional reflections on the A-Zone, joining an interview and two reflective essays that appeared in the original edition of the zine. The history of the Autonomous Zone has a relevance for those outside of Chicago, as the A-Zone was typical of anarchist experiments in counter-institutions and infoshops undertaken by anarchists in the 1990s and as such the writings within cover an important aspect of recent anarchist history. It gives an interesting snapshot of the infoshops of the 1990s and the related anarchist milieu. Beyond the A-Zone, the zine talks about the Love & Rage anarchist federation, the anarchist networking project (Dis)Connections and the related Network of Anarchist Collectives, as well as the Chicago-based projects Baklava Collective and Wind Chill Factor. Also covered are Food Not Bombs, Anarchist Black Cross, and Anti-Racist Action. This entry was posted in Zines and tagged anarchist history nerd brigade, infoshops, north america, organizing, the a-zone, zines on March 18, 2015 by anarchist history nerd brigade. A new version of “Claim No Easy Victories” has been posted as the old version had some odd formatting errors. The new version should be easy to print and reproduce. Additionally, new versions of all of our zines have been posted. For the most part, they are the same with the addition of proper contact information. We have also added screen readable versions. We’re currently at work on a few projects, including a zine on the history of the Autonomous Zone in Chicago. This entry was posted in General and tagged anarchist history nerd brigade on February 26, 2015 by anarchist history nerd brigade. Recently while reading Michael Schmidt’s Cartography of Revolutionary Anarchism, we came across a reference to an article by Matthew Hart that explores the history of the Anarchist Black Cross. Hart makes the argument that the anarchist prisoner support effort is one of the longest running anarchist projects. We’ve put together a zine version of the article and also are reprinting it here. This entry was posted in Zines and tagged anarchist black cross, anarchist history nerd brigade, history, zines on August 6, 2014 by anarchist history nerd brigade. Claim No Easy Victories: A History and Analysis of Anti-Racist Action is a piece that was written by Rory McGowan in the early 2000s on the history of Anti-Racist Action (ARA). The article originally appeared in the Northeastern Anarchist, a magazine published by the North Eastern Federation of Anarcho-Communists (NEFAC). We reprinted it as a zine because there unfortunately aren’t many histories of Anti-Racist Action (ARA) out there despite its role in recent anarchist history. This entry was posted in Zines and tagged anarchist history nerd brigade, anti-racist action, history, north america, organizing, zines on June 7, 2014 by anarchist history nerd brigade. This zine is a reprinted version of Mob Action Against the State: Haymarket Remembered …An Anarchist Convention, a long out of print book that provides a collection of experiences from the 1986 Haymarket Remembered conference in Chicago. You can download the zine here. This entry was posted in Zines and tagged anarchist history nerd brigade, gatherings, history, north america, organizing, zines on June 7, 2014 by anarchist history nerd brigade. This zine presents one version of the history of the anarchist context out of which the Love & Rage Revolutionary Anarchist Federation emerged in the early 1990s. There is no doubt much that could be said about the period and many different conclusions could be drawn. 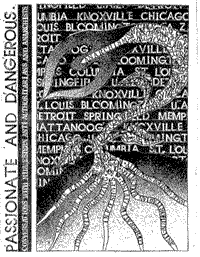 One route some anarchists took – very controversial at the time – was to form a federation to increase the level of organization amongst anarchists in the U.S.
Love and Rage broke apart in 1998 following wide-ranging internal debates over politics and goals (for example, some folks became Marxists). AK Press published a short book titled A New World In Our Hearts: Eight Years of Writings from the Love & Rage Revolutionary Anarchist Federation on the federation, but folks would do well to dig up the various critiques of Love & Rage’s politics (and practice) that circulated within the anarchist space. This zine presents Love & Rage’s interpretation of anarchist struggle in the 1980s and 1990s (the history originally appeared in the “1997 Member Handbook” published by the New York Local, it’s been trimmed here for relevance). To be sure, its bias is towards making the case for a federation style of organization. Setting that aside (as hard as that may be), it presents a history that has been largely lost. We present it not to advocate for federations (which have a rather long history of not working out so well), but rather out of interest in the accomplishments and missteps of previous generations of anarchists. This entry was posted in Zines and tagged anarchist history nerd brigade, history, love & rage, north america, organizing, zines on June 7, 2014 by anarchist history nerd brigade. The Anarchist History Nerd Brigade is a small anarchist publishing project exploring anarchist history in North America post-1970.